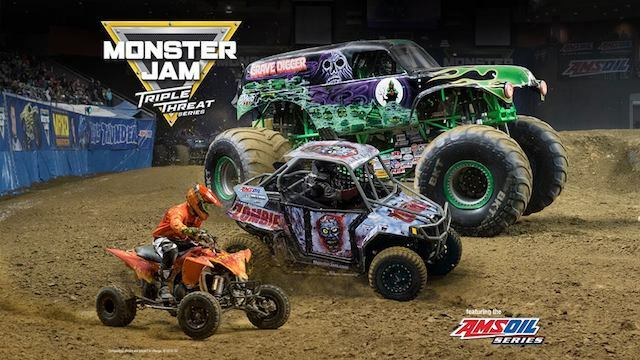 The Monster Jam Triple Threat Series, the most adrenaline charged motorsports experience for families on the planet, is coming to the Pacific Coliseum in Vancouver April 7-9, 2017. Tickets: Starting at just $15 each. Tickets are available for purchase online via TicketLeader, charge by phone at (604) 252-3700 or visit the PNE Box Office. *Prices subject to change; additional ticketing/venue fees may apply. On Saturday, there’s a Pit Party open from 10:30:00am to 12:00pm, Pit Passes are available to purchase for an additional $10 each. The Monster Jam Triple Threat Series is a points-based format that showcases the best lineup of Monster Jam vehicles that deliver what fans want to see most – more trucks, more racing, more freestyle, more donuts, more wheelies, more action! Approximately 12 feet tall and about 12 feet wide, Monster Jam trucks are custom-designed machines that sit atop 66-inch- tall tires and weigh a minimum of 10,000 pounds. Built for short, high-powered bursts of speed, Monster Jam trucks generate 1,500 to 2,000 horsepower and are capable of speeds of up to 100 miles per hour. I will draw one winner at random from all entries at 12:00pm on Thursday, March 30, 2017. Update The winner is Erica! This is such a great show, but bring earplugs! I would love to win tickets to take my sons! Went as a kid and loved it! Should take my two. My boys would be so excited! This show looks like it will be a lot of fun. Love for my hubby and son to go again!! They went when he was young and had a great time! My 5 and 2 year old would LOVE this! My friend and i would love to see this for the first time! My twins would enjoy this. I would love to take my sons to this! They would love it. Oh, yes please! Let it be me. Fingers crossed. My kids would love to go and see this awesome event!! Hope to win! Schweeet! Love how they are so great with the kid fans! My son loves attending Monster Jam! So hoping to take my kids to this!! Best site to find out what to do! Have great time to the winner! This small town girl (mom!) would love to take her big city daughter and son and see the big muds!!! Never been. Would be fun. Truckasaurus – ONE DAY ONLY!!! ONE DAY ONLY!!!! Would love to take my son!!!! Would love to sell this. Super cool! My boys would love this. Cool event for my super cool friends! Oh this would be an amazing event for my son to enjoy! Our two boys would love it, and remember this forever!!! I know my boys would love to see this! Me and my old pa would love to see this! I would love to take my son to this, he loves monster trucks! Would love to win tickets. Looks like fun for the whole family! I WANT TO WIN THESE SO BADLY! My husband and son went last year and had a blast. Would love to go as a family this year! Would love to take my son to this!! Would be sweet . Thanks for entry for a chance to win.